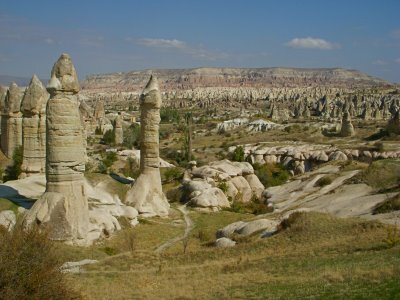 Well, you’re looking at it—the love valley of Cappadocia, the land of giant erected penises. 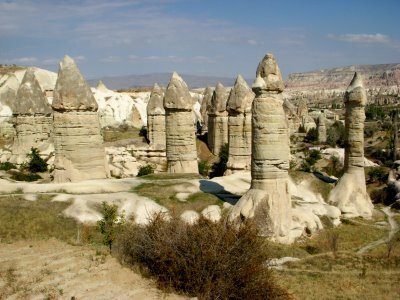 I am not to sure if the reader can discern a little Divine direction in the natural sculpture work of these giant erected penises, but I do. This can be kind of strange for some, I mean really, Mother Nature sculpturing giant erected penises for the world to view, oops I forgot to censor. Wow, does that mean mother nature is a female—not—nor a male. The Divine is omnipresent. Guess what? Someone was saying the Flintstones sculptured the love valley, after all, this area does look like bedrock, plus there is the Flintstone bar and a hotel. Could it be Wilma and Betty living a little in the wild side, please don’t tell your children. You really have to wonder what the Christians thought when they arrived in Cappadocia to escape the persecution of the Romans, although the suppression of sexuality began after the corruption of 325 CE. Well, I am sure some Christians snuck out into the love valley to make some bacon in the middle of the night. Gee, not even the White Desert of Egypt has a love valley, difficult to understand. 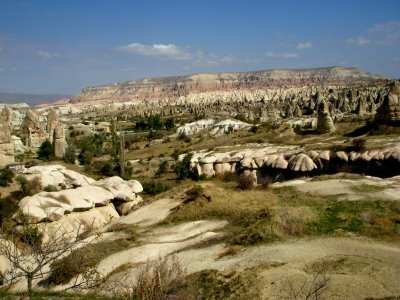 The valley in the background is the Rose, Red and Kizilcukur Valleys, notice the beautiful range of colors. I will have better close ups of this area posted soon that I took in a closer location.